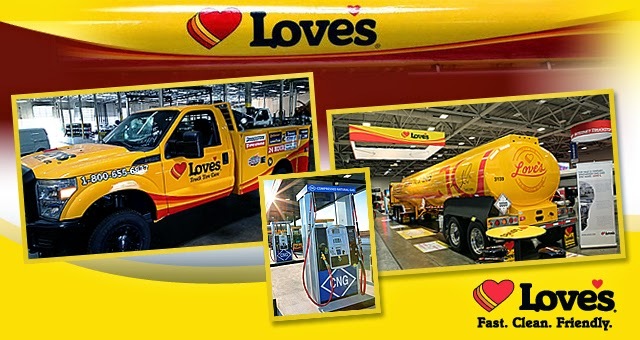 When visitors visit Love’s Travel Stops & Country Store’s (Love’s) booth at this year’s Natural Gas Vehicle (NGV) Conference and Expo in Kansas City, Missouri, it will be evident that the convenience store and travel center giant is committed to the natural gas vehicle industry. The booth will showcase a Westport WiNG™ Power System dedicated compressed natural gas (CNG) Ford F-350 truck used to service fleet operators at Love’s Truck Tire Care centres. Also featured at the bright yellow and red booth will be a mock-up version of Love’s signature Integrated In-Lane Fueling station with a Cummins Westport (CWI) 12-liter compressed natural gas (CNG) engine powered Peterbilt truck. Nationwide, Love’s is the only travel stop that offers an integrated, in-lane fueling experience for heavy duty vehicles in every lane. These full service travel stops combine cardless radio frequency identification (RFID) technology, diesel, diesel exhaust fuel (DEF) and fast-fill CNG (where available) in a single-lane to provide time-saving convenience with access to multiple fueling solutions for operators. The Truck Tire Care centres, open 24 hours a day, offer tire care and roadside assistance to ensure trucks stay up and running. Internally, Love’s is also committed to adopting CNG for its operations. Last year, the company purchased 25 Freightliner Cascadia and 25 Peterbilt trucks with Cummins Westport’s 12-liter CNG engine for its fleet of fuel haulers, operating under their Gemini Transport brand. The company made the decision to add the trucks after participating in a beta program, putting 175,000 miles on the truck. The program allowed Love’s to learn about the cost benefits of using CNG and how to operate a CNG fueling station. The NGV Conference and Expo takes place November 11 to 14, 2014 and will have a 90,000 square foot expo, the largest of its kind, featuring the full spectrum of vehicles, components, equipment packagers, service providers, design-engineering firms, and program consultants. With informative educational sessions and a comprehensive ride and drive program, the show promises to be a one-stop-shop for everything needed to achieve NGV success.